Optional "See-through" crystal styrene lids keep contents dust-free and protected - call for information. AkroBins are heavy-duty and securely stack on top of each other, sit on shelving, and hang from Akro-Mils racks, panels, rails and carts. Unaffected by weak acids and alkalis the sturdy one piece construction is water, rust and corrosion-proof. Finger grip allows for easy handling. Large label slot for easy identification of contents. Autoclavable up to 250° F. Guaranteed not to crack or break under normal load conditions as stated in the 1-year limited warranty. 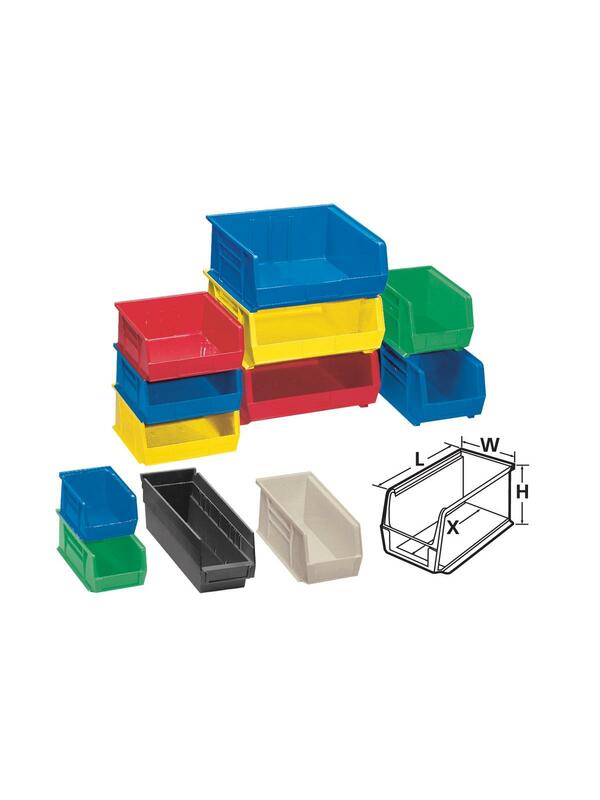 Optional dividers and labels available, see Related Items tab. AkroBins available in Red, Yellow, Blue, Green, Black, Stone, and Semi-Clear. FOB Shipping Point. 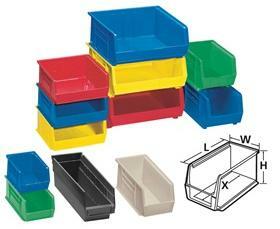 L x W x H 10-3/4 x 8-1/4 x 7" 10-7/8 x 11 x 5" 10-7/8 x 16-1/2 x 5" 10-7/8 x 4-1/8 x 4" 10-7/8 x 5-1/2 x 5" 14-3/4 x 16-1/2 x 7" 14-3/4 x 5-1/2 x 5" 14-3/4 x 8-1/4 x 7" 18 x 11 x 10" 18 x 16-1/2 x 11" 18 x 8-1/4 x 9" 5-3/8 x 4-1/8 x 3" 7-3/8 x 4-1/8 x 3"
L x W x H 10 x 6-9/16 x 6-3/4" 10-1/4 x 10 x 4-3/4" 10-1/4 x 3-3/16 x 3-3/4" 10-1/4 x 4-3/8 x 4-3/4" 14 x 14-3/4 x 6-3/4" 14 x 6-9/16 x 6-3/4" 14-1/16 x 4-3/8 x 4-3/4" 17 x 9-1/2 x 9-3/4" 17-1/8 x 14-3/4 x 10-3/4" 17-1/8 x 6-3/4 x 8-1/4" 4-3/4 x 3-7/16 x 2-13/16" 6-3/4 x 3-7/16 x 2-13/16" 9-3/4 x 15 x 4-3/4"